Musing on the above lines during our calm times can bring in healthy and happy relationship with children. That spirit carries over to the relationship with others too! All of that can add to our in-depth living. "The mind is not new if it has not died to all things of yesterday, to all the experiences, to all the envies, resentments, loves, so that it is again fresh, eager, awake and therefore capable of pure attention. Surely, it is only when the mind is free from all sense of inward dependence that it becomes one with that which is immeasurable." Reflection on the above can bring about a change that is not within the imaginations of the mind. What does it mean to stand behind the mind and observe it? This cannot be done through any technique; the reason is that all practices are rooted in self-interest that keeps us arrested in the mind. When there is the eagerness to understand ourselves, self-awareness sets in and moves the center of attention to the region behind the mind. One becomes a bystander to oneself. This augments mental quietude and adds a spiritual dimension to our daily life. The tendency to chase ego-satisfaction, be it through religion or otherwise, gets abated. Abundant feeling towards all living creatures begins to express itself through us. 1. Why is it that not all aspects of the NDE occur to every experiencer? 2. Why do a few of the experiencers (about 3%) have a frightening NDE? 3. Does the way we live affect our NDEs? These are some of the interesting issues in the research on NDE. If you had an NDE, please communicate with me and contribute to the research. In turn, you will also be benefited from the others' NDEs. When the essence of NDEs becomes common knowledge, it will help human beings live without the fear of death and the fear of life too! This is about pre-death vision and telepathy. The following excerpt is taken from the book "Transformed By The Light" authored by Melvin Morse, MD and Paul Perry. After examining many cases of pre-death and shared visions, Melvin Morse says that he can only speculate that the same conditions that trigger a near death experience also trigger the ability to communicate with others. He quotes the case of Edna and Tom of Phoenix, Arizona. Their daughter was seriously ill with cancer in Milwaukee. After some treatment, she showed improvement. However, the night after a chemotherapy session for her, Tom woke up in Arizona to see his daughter standing at the foot of his bed. She was dressed in white and glowing brightly. She sat at the foot of the bed and talked to her father. He could not understand anything that she said but he felt a deep sense of peace at seeing her so "dressed up". Tom immediately awoke Edna and told her what he had just seen. Edna did not question whether it was a dream. Both of them knew what it meant - their daughter had died. In a few hours they received a call from their distraught son-in-law telling them what they already knew. There are quite a few things from this episode that we are confronted with. The place of consciousness beyond the mind, our continued existence in a different realm after bodily death, the communicability of a being from that realm, the ephemeral nature of life on this planet and its emphatic impact on us to be compassionate in all our relationships - these are some of the issues that we would like to reflect on. Such reflections are sure to enrich our lives. "Although physicists are mainly concerned with rational knowledge and mystics with intuitive knowledge, both types of knowledge occur in both fields. This becomes apparent when we examine how knowledge is obtained and how it is expressed, both in physics and in Eastern mysticism." 'There the eye goes not, speech goes not, nor the mind. By discerning That, one is liberated from the mouth of death.' "
These lines from Fritjof Capra explain why the skeptics are unable to appreciate the messages from Near Death and Out-of-Body Experiences. "Only in relationship can you know yourself, not in abstraction and certainly not in isolation. Even in a monastery you are related to the society which has made the monastery as an escape, or closed the doors to freedom. The movement of behavior is the sure guide to yourself; it is the mirror of your consciousness; this mirror will reveal its content - the images, the attachments, the fears, the loneliness, the joy and the sorrow. Poverty lies in running away from this, either in sublimation or in its identities. Negating without resistance, this content of consciousness is the beauty and compassion of intelligence." The above pointer can generate the necessary interest in us to direct our attention into ourselves and let the understanding bring about the transformation in its own way. As you live more experiences, more memories accumulate, and it becomes a mountain - really heavy. People are crushed under it. The moment you see that it is useless, you can drop it. It is not clinging to you, you are clinging to it, so you simply take your hands away. Like the last Pointer, this one is also from Eckhart Tolle. While discussing the matter of suffering, he says, "Suffering is necessary in order to understand that it is unnecessary."! Probing into this profound statement can help us gain insight into our life on this planet. "The secret of life is to die before you die and know that there is no death." It is clear that the first 'die' refers to the psychological death and the second 'die' to the physical death. If the first one takes place, then one understands that, in the ultimate essence, one is immortal. Then, the question obviously is: How does the psychological death come about? Pondering over this question, one begins a journey into oneself. When the journey reaches sufficient depth, the psychological ending can take place. Thus, guiding oneself along that journey becomes the natural aspiration for the spiritually interested people. Reflection along those lines can be quite absorbing. J Krishnamurti often talked about choiceless awareness bringing radical transformation in us. We cannot take it up as an item to be practiced because then we have made a choice! So, choosing to be choicelessly aware is a contradiction in terms. Then, how does choiceless awareness come into being? Is it an accident? It would be nice to address ourselves to that question. People of Near Death Experience come back to tell us about their renewed vigor to live - live vibrantly and meaningfully. They find meaning in every movement everyday, because when they are on the other side, they understand that everything is right and designed to help us evolve towards Divinity. The rest of us - those who have not had a NDE - can derive a lot of insight and inspiration from those perceptions. The immensity of the Universe is yet another pointer towards understanding our position within the larger scheme of things. 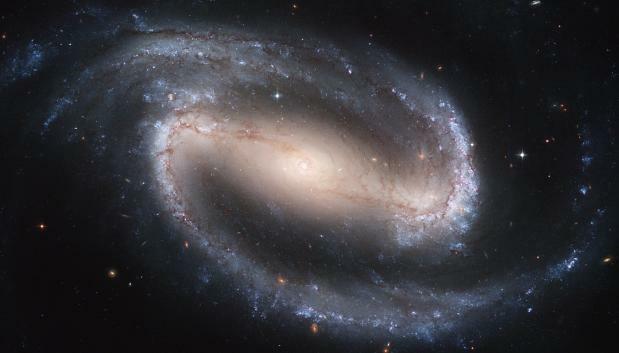 It is known that there are billions of galaxies in the Universe. So, there must be trillions of stars and even a greater number of planets. Many of them are likely to be habitable. That is, many more and many different living beings would be there in this immensity. That gives us an idea of where we stand. The claustrophobia in space dissolves; also, the one in time. The following photographs were released by NASA and made public by Yahoo (Aug. 2011). 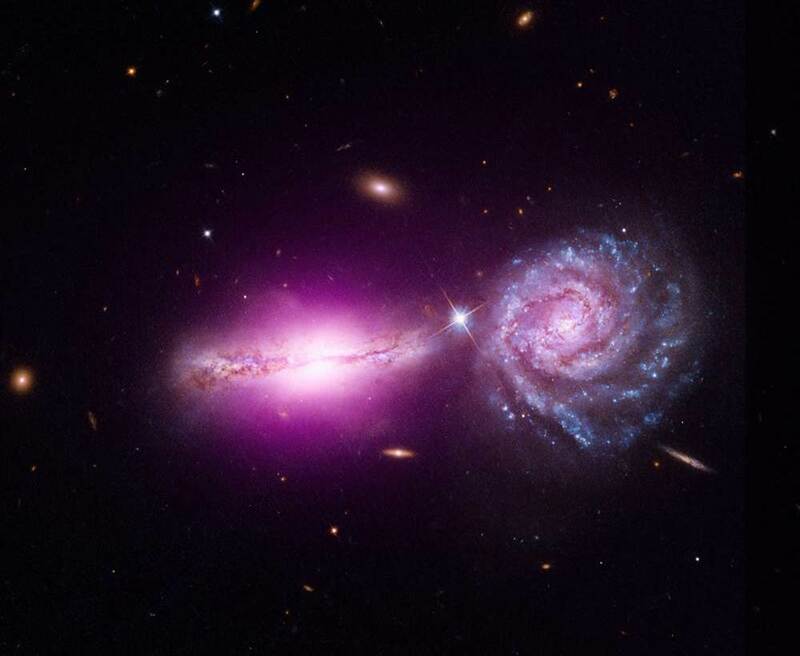 The photo on the left is a case of galactic collision, millions of light-years away. So, by now, perhaps, they have finished their job! accompany our daily life and help us appreciate Life's greatness.